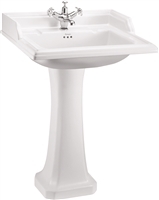 The Burlington Classic 650mm Basin with Invisible Overflow and Pedestal has a traditional appearance, lovingly crafted and hand finished with exceptional care using the finest materials and manufacturing processes. 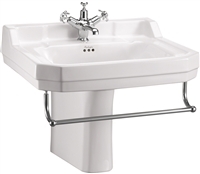 The Burlington Classic 650mm Basin with Pedestal has a traditional appearance, lovingly crafted and hand finished with exceptional care using the finest materials and manufacturing processes. The Burlington Edwardian 800mm Basin with Pedestal has a traditional appearance, lovingly crafted and hand finished with exceptional care using the finest materials and manufacturing processes. 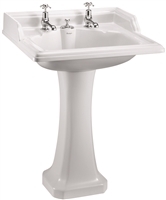 The Burlington Edwardian Round 560mm Basin with Towel Rail & Pedestal has a traditional appearance, lovingly crafted and hand finished with exceptional care using the finest materials and manufacturing processes. The Burlington Edwardian 610mm Basin with Towel Rail & Regal Pedestal has a traditional appearance, lovingly crafted and hand finished with exceptional care using the finest materials and manufacturing processes. 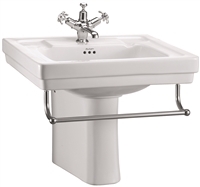 The Burlington Contemporary 575mm Basin with Towel Rail & Semi Pedestal has a traditional appearance, lovingly crafted and hand finished with exceptional care using the finest materials and manufacturing processes. The Burlington Victorian 610mm Basin with Towel Rail & Semi Pedestal has a traditional appearance, lovingly crafted and hand finished with exceptional care using the finest materials and manufacturing processes. The Burlington Edwardian 610mm Basin with Towel Rail & Semi Pedestal has a traditional appearance, lovingly crafted and hand finished with exceptional care using the finest materials and manufacturing processes. 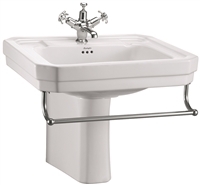 The Burlington Contemporary 575mm Basin with Towel Rail & Pedestal has a traditional appearance, lovingly crafted and hand finished with exceptional care using the finest materials and manufacturing processes. 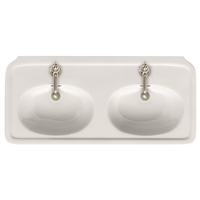 The Burlington Victorian 560mm Basin with Towel Rail & Semi Pedestal has a traditional appearance, lovingly crafted and hand finished with exceptional care using the finest materials and manufacturing processes.